I’m so happy this work by Craig is finally going up on the site. There was an extraordinary amount of work put into this post, not just in the writing and visuals, but in the meticulous effort he has put forth in mining all the data throughout the site. Extra thanks to Matt’s amazing contribution as well in processing and developing the data set. Readers of this blog often share the results of their test results in comments, tweets, and emails. I’ve been collecting and labeling these into a dataset. This article presents a summary of the nearly 200 data points extracted from the comments through October 1st. Special thanks to Matt Allington who put together the interactive visualizations for this post. Matt is a Power BI reporting professional (and LCHF advocate) at http://exceleratorbi.com.au. What’s great about this quartet is you can use the Friedwald equation to verify their consistency or to interpolate the missing fourth score, if not provided. Units are also easy to detect and convert. The most commonly used units are mg/dL in America and mmol/L in Europe. I made a heuristic to guess the units based on their range, and converted everything to mg/dL for display purposes. Other test results were much less common. These included particle counts (HDL-p, LDL-p), glucose, HbA1C. See my previous post for recommendations on the best tests to get. 1. Bias – These data were self-reported, not scientifically sampled. I would suspect that most readers found this site after switching their diet to LCHF, and probably after getting a high cholesterol score. 2. Accuracy – This data is not independently verified. In very few cases have I actually seen the corresponding Labcorp/Quest report. Contributors may also have misremembered or made a typographic error when submitting their comment. Commenters on CholesterolCode.com reported an increase of 95 mg/dL LDL-C on LCHF compared to a standard diet. This makes intuitive sense, since the primary job of the lipid system is to deliver TG energy, and LCHF uses more energy from fat, so you’d expect more “boats” in the blood. However, due to increased HDL and decreased TG, their reported TG/HDL ratio decreased by 0.8. Although most doctors will panic about 100 points of LDL-C, TG/HDL is a much better metric. So just judging from this data, on average LCHF dieters are at lower risk of CVD than standard dieters. 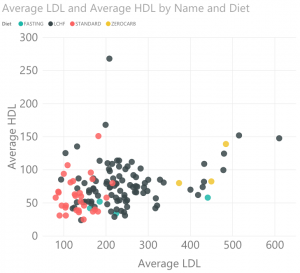 Here’s the scatterplot of LDL and HDL, interactive link here. In this chart you can clearly see the increased LDL for LCHF (black dots) compared to Standard (red dots). The gain in HDL is visible too, but less obvious. Although there are only 3 data points, Zerocarb (yellow dots) stands out for having among the highest LDL. 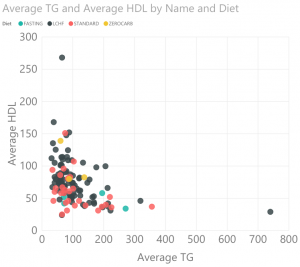 Here’s the scatterplot of HDL and TG, interactive link here. In this chart, you see the LMHR cluster (LCHF in black) in the <100 TG, >100 HDL zone. I’d be most concerned about the health of the cluster of in the 200 TG, <50 HDL zone (mostly Standard diet in red). Want to have your data included in the next version of this post? Glad to have you onboard, citizen scientist! I’ve been on a low-carb, high-fat diet for the past 12 months. Here are the results from my most recent labs from September 2017. If you also happen to have results from your previous diet, we’re excited to see the change. Just include the old numbers and context in a second block, similar to the first. I used the context of the comment thread to try to assign labels to each data point. I wanted to know the the diet, lifestyle, exercise, date, and any other commonly-reported factors that might influence the results. The primary label I consistently applied is the diet. Here, I assigned to one of 4 mutually exclusive categories. – Standard – Broad category of diets that follow the food pyramid’s advice to emphasize “fruits, veggies, and low-fat dairy”. Typically <30% of calories from fat. – LCHF – Broad category of diets that limit carbs and embrace fat. Typically >50% of calories from fat. – Zerocarb – All-animal product carnivorous diet. – Fasting – Any fast of 3 or more days leading up to the test. – Duration – When available, I added a duration as a qualifier to their primary diet. – Exercise – Anything from endurance, strength, high-intensity intervals, to vigorous walking. – IF – Intermittent fasting. Any form of time-restricted eating including 16:8, one-meal-a-day, alternate day, etc. – Test <X> – To distinguish multiple tests in a simple post. Typically X will be a year. – Losing Weight – If the contributor reported a period of weight loss during this test. – Lowcal – The contributor reported lower-than-usual eating leading up to the test, as per the Feldman protocol. – Highcal – The contributor reported higher-than-usual eating leading up to the test, as per the Feldman protocol. – Non-fasted – If there was any reported eating in the 12-hour window before the test. These points are excluded from calculations. – Duplicate – If the contributor posted the same test result in multiple comments. These points are excluded from calculations. I downloaded the raw comment database and wrote a script to process the data. The script worked over a csv data file with the lipid scores, lifestyle tags, and thread context. It generated an updated version of the data file with standardized units and an html page with the scores highlighted. It could also generate rows for candidate comments that looked like they might have a data point. In the end, I still had to type numbers into a sheet, but I had some nice tools to validate my work. Happy to share regular multi year data pre and post 12 mo LCHF . Please advise email address for data . I’ve been on a low-carb, high-fat diet (60%) for the past 12 months. since diagnosis. Here are the results from my most recent labs from AUG 2017. WAS on standard ( actually low fat ) since forever before that . Hba1c 90=> 42 in same period 30kg down. In mid-august I switched to ZC, and will be getting bloodworm done in November to see what (if any) change occurs in those numbers. I’d be happy to add those when I get them done. Those number’s look great, thanks for sharing! You’re just a few HDL points away from Dave’s LMHR. Are you still losing weight? How about exercise? What don’t u guys think? That’s a pretty typical before and after numbers. Looking very healthy, congrats on the great progress! I’m also “thinner than my doc wants”, but I’m the same as I was in college. I think I just have a low set point on weight. I might try active muscle bulking next year. Looks like you’re similar to me. I’m 6% body fat and exercise a lot, getting enough animal protein is key (fat will naturally increase too). This is what I’d do… You don’t give your weight/age but consider taking your protein up to about 140g if you’re around 70kgs. 115g looks too low to maintain solid muscle. Also make sure you get 40-50g protein per meal – could try going back to 3 meals per day. Add more meat, fish, cheese and eggs… and less veg. Just get your protein level right. More protein on non-exercise days too, interestingly enough. Age 42. I’m 6-2 and 145 lol. All muscle, probably below 10% bf. Yea I’ve upped the protein the last 2-3 weeks. Up around the 140g range. Thinking I’ll have to keep upping calories until I hit my range to gain weight. Hopefully I’m not one of those that needs 4-5000 cals to gain. Back in college I lifted also and played and needed 3600 to gain. Was hoping with the 20 years m metabolism wound oh slowed a bit but not looking like it. Not looking forward to 2000 cals a meal. After that ZERO processed food, Moderate Carb/Moderate protein/Moderate Fat (mostly saturated). Don’t really count anymore. Age 60 years – Activity level :- 1 Hour of walk everyday, otherwise sedentary. Thank you for sharing, and congrats on cutting the processed food. IMO that alone is 100x more effective at improving your health than anything in the pharmacy. e.g. If the doc thinks a) LDL -> b) inflammation of arteries -> c) atherosclerosis -> d) heart attack, then show him/her b) hsCRP, c) CAC score. If those 2 are ideal, then their logic is either wrong, very slow to manifest, or doesn’t apply to you. I’ve been on a low-carb, high-fat diet for about 7 years. Here are the results from my most recent labs from August 2017 I’m 63 years old and I exercise at low impact 2-3 days a week. The following is my full lab report. Ted Naiman is my doctor. It didn’t format well, sorry. The hsCRP is 1.8 in the same report – CAC was not examined. My guess is that these are pointing to excess iron. I went to donate blood, but they wouldn’t take it as I had a recent trip to South Asia – Apparently one has to wait 2 years after a trip to that region before they consider your blood safe from undetectable parasites. Any advise on any other strategy to reduce iron. Sam – I believe your doctor can write an order to have have blood drawn. Your blood would not then be used for donations. I’ve been on a low-carb, high-fat diet (LCHF) for the past 18 months. 12 months ketegenic (<50g carbs), 6 months low carb (<100g carbs) Here are the results from my most recent lab test from July 2017. I’ve been on a low-carb, high-fat diet for the past 6 months. Here are the results from my most recent labs from October 2017. BMI 19. Run 1 mile 1/wk, sometimes 3 miles. Yoga 1/week. Walk kids to local school daily and back. HbA1c 5.3. No other lipid details, unfortunately. Thanks for the contribution! It’s exciting to have another zerocarb result! So, the high LDL-P isn’t a CVD risk given the low Trig, High HDL? My numbers are similar while off statin, and lipidologist wants me back on a statin + ezetimibe. There is a healthy debate going on about whether high LDL-P is a causal element. Even if you assume it is, its still reasonable to try to evaluate your overall risk based on all the factors, including TG/HDL, inflammation, etc. If the result of that (based on your personal assessment and any professional advise) is that your risk is higher, then you need to consider the tradeoffs of quality of life, energy level, focus, hunger, etc. If you are >40 years old, the ultimate risk assessment for CVD is CAC. If you have a low score there, you have significant leeway to choose the lifestyle where you feel best, and wait for the research to figure out the details. Thanks for the contribution. Looks like a classic LMHR profile. I have been LCHF since 3/2014. I had “normal” lipid values before the swich (was high carb previously). My numbers have looked pretty much like your last lab results ever since. The only thing to note is after ~3.5 years of this, I have developed xanthelasmas under my eyes. Be observant of any changes like this as I don’t know/understand what this could mean. Here are my results. I started low carb on January 2, 2014. I’m currently eating near zero carb. For instance, yesterday I ate basically all meat and some olives. However, I still eat some vegetables. These were all 12+ hours fasting, except that the 9/18/15 and 3/4/16 were after 4.5 days fasting. The test on 9/18/15 caused my doctor to freak, and at the time I took the test after 4.5 days fasting because I thought that would make the numbers better…which I now know to be a mistake. So, I tested to see what would happen if I took a 12 hour fasting sample (2/29/16) and a sample later in the same week after 4.5 days fasting (3/4/16). In this time period, I’ve lost 50+ pounds. I also started intermittent fasting in about March of 2015, and I’ve used various IF schemes. I’m currently fasting 36-40 hours twice per week and one 20-24 hour fasting per week, with skipping breakfast most days. I take breaks though of 1+ weeks duration to give my body a rest. You can see that these are all over the map, even if you cut out the two outliers caused by fasting 4.5 days. The only thing consistent (assuming the outliers are cut out) is HDL keeps improving. I plan on doing Dave’s 10 day test and segueing into a test of Ted Naiman’s higher protein low carb diet to see what happens, but I’m waiting for a continuous glucose monitor to arrive. That should be here within a few weeks. I’ll report back once those tests are taken. Great data set! Thank you. The doctor expressed concern about the increased total and LDL values from the last one but didn’t suggest any intervention. Great sequence of before and after, thanks! Dave, really enjoyed watching your video from Low Carb Down Under. Here are my results. I started moving away from sugar, low-fat, and high-omega-6 oils after the August 2008 reading. After many baby steps, I was mostly primal/LCHF by 2012 and have been since. Have been cycling 3-5x per week 30 mins 80% of the rides — other rides range from 1-5 hours — plus 1 hour/week with personal trainer workout. No IF or fasting (yet?). Lost 20 pounds from August 2008 over 12 months. The LDL below is calculated — if I had Direct LDL, I mention in Notes. Also had a CAC Score of 0 on 01/08/2013. Wow! That might be our first lipid panel from the 80’s. 🙂 Congrats on the 0 CAC. I’m curious about your training, have you tried the Maffetone method of low heart rate training? Your TG have stayed persistently high, and I wonder if it wouldn’t help to build up some fat-burning mitochondria. Thanks for the reply — glad I circled back here! My work with a personal trainer has been a combination of approaches: core, mat, pilates, TRX, kettle bells, resistance, Cybex. I hadn’t heard of Maffetone, so I looked it up — looks like running, but I haven’t dug in too much yet — I stopped running after an ACL reconstruction and meniscus removal, but I do cycle a lot. One followup question — either here in the comments or private message — I will be doing an NMR test in a couple of weeks, and I’d like to try the Feldman Protocol. Somewhere I read that for those of us like me who’d like to try it, to reach out for more specific details to do it better. Would very enjoy getting the details. Hi. Just discovered you through a podcast – so interesting! So I’ve got a life insurance medical exam coming up and want to reduce my total cholesterol. Last year my #s were: total (237), hdl (69) triglycerides (53). I’m 38 yo female, not overweight. I don’t eat exclusively LCHF, though I lean that direction for sure. I’m probably closest to paleo more than anything else though i do eat occasional GF grains & raw or goat dairy. Would you recommend this 3 day high calories high fat approach for myself & this situation? Also how do I determine ‘high calorie’? And must the blood test be in the AM on the 4th day? Thanks for your help – greatly appreciate it & look forward to leaning more! Yes, if your only goal is to game a single test for low TC, the high calorie Feldman Protocol is the way to go. The high-calorie days before the test, you can generally stick to your normal diet — just increase the quantity. Paleo can be very satiating, so it might be easiest to add some fatty cuts of meat, or some extra olive oil on your vegetables. The test needs to be after a 12-14 hour fast, so it’s much better to do that in the morning. If you waited until the afternoon, your fast would be ranging up to 20 hours, and that will typically increase TC. And the above numbers are correct. I did not mix up LDL and HDL. And I don’t drink alcohol so that’s not the reason for the high HDL. I don’t know why they are at these levels but my doctor says I’m pretty much heart attack proof. I am a 67 year old female. I’ve lost over 100 pounds in the past two years and am now at normal weight (BMI 23.7). I exercise (yoga, HIIT, walking, and strength training) for 1-2 hours per day. I eat less than 20 net carbs, about 50 gms protein and 80-100 gms fat totaling about 1100-1200 calories a day. I do 16:8 hour fasts daily. I was diagnosed with T2 diabetes seven years ago with an A1C of 13.6. My last one was 5.4. I was taking the max dose of two high bp meds and my bp was still around 140/90. Now I take none and it’s around 115/55. I sleep well. I’m happy. I’m not hungry. Thanks for the contribution! Congrats on reversing T2DM! It sounds like you are doing great now. Please advise. I need to get another blood test soon. My last one was high and Dr wants to put me on statins which I resist. I am 5’6, 8st 11, 74 years old, fit and in good health. My cholesterol has always been high ish but has jumped from 7 to 9.5 on LCHF diet. You suggest eating high fat for 3 days prior to blood test. But should this be a fasting blood test? When should the last food be consumed before the test? You have at least 2 options. Option 1, is to get more/better tests, so you can make an informed decision without being stuck on LDL-C.
Option 2 is to use Feldman Protocol to game the short-term variability of LDL-C to get your Doc off your back. Or you can just looked the effectiveness and consequences of whatever is being suggested and decide based on that. Keep an eye out NNT (number needed to treat) and NNH (number needed to harm). These are my profiles going back to 2011 and as you can see I have always had high C which gets me into trouble with my doctors every year. I have been on statins off and on, mostly off, but none the past 2 years or so. When we began lchf in July 2016 I had a test in August and my doctor nearly died! She said she has never seen a total C so high in someone still alive and referred me to a cardiologist. I didn’t go. I’ve changed doctors who I am ‘educating’ and shared my delight in my Trig/HDL and explained how that worked. I have an appt for a CAC scan next week and I have already sent her info. She is ultimately really supportive. My other stats: 59 year old female, 157 cm, 55 kgs, waist 76, BP, BMI and other within normal, healthy range 🙂 I’ve lost nearly 10 kgs since Aug 2016, go to the gym at least twice a week and am fit and active. During this time I’ve lost 170 pounds, used intermittent fasting, and also endurance running. I’m on what some of you might call a “zero-carb” diet. I eat meat and vegetables (mainly salad of chard, carrots, cucumber and celery). The carrots and cucumber are pretty sweet. I also eat about a pound of bacon a day and it has brown sugar in it. I’m pretty sure I’m not in ketosis but don’t know. I’d like to add more fat and trim the protein but find it difficult. I can’t tell you why the difference in a month, but I will keep better track now. I also had “bad” kidney function results of GFR=51 and GFR=53 on Sept 19 and Oct 12 respectively. I’m 56 years old. I feel like I’m in great health. I’m very strong and lean. I’m more worried about the kidneys and less worried about the LDL even though it is super high. Thank you for this work Dave and thank you to everyone else involved. Hi there, I messaged Dave on twitter and he said he’d look at my results somewhere on his blog so I think this is where I need to post. I’m currently doing Dr Shawn Baker nequalsmany carnivore study and got bloods done the day before I started, 14 August 2017. Up until then I had been doing LCHF since November 2014. I’m in Australia so my blood work results come in mmol/L units. I understand I’m obviously a hyper-responder but any insights would be highly valued and I’m happy to offer myself up as a test guinea pig should it help with any science. I’m due for a another round of bloodwork at the end of the carnivore study in about 20 days. At the same time in August I had other bloodwork done – not sure if you’d want those results too or not, just let me know. Thank you for all you do. We’re signing up as a Patreon too, which can’t be much unfortunately but every little bit helps I hope. I’ve been eating LCHF for about 18 months. Here are my most recent lab results, taken September 2017. Has anyone tracked their bloodwork from day one of keto? It seems like most people check it 6-8 months after starting and their TRIGS have decreased. I have been doing intermittent keto, 5 days keto & 2 off, for 9 months and am in great shape doing this (6’3” 180lb, 15% BF). I just started an extended strict keto test to see how my Lipid Panel would change. My TRIGs have been steadily increasing in weeks 1-3 so far (150 > 225 > 300). Has anyone else seen this? Is this just a keto adaption period where my body is producing TRIGs for energy, but my cells haven’t adapted to absorbing them yet leading to high serum levels? My ketone levels are 2.0-3.0 mmol/L for all the bloodwork, so I am in Ketosis. LCHF over a year. Prone to sugar binges. Lost 40 pounds in 15 months. Numbers are pre-LCHF (12/14), soon after starting LCHF (6/2016), to now (10/17). My LCHF and weight loss (+ exercising!) journey. IF: I skip breakfast and hence “fast” 13-15hrs on most days. Some 24-36hrs fasts here and there but not consistently. Had a CTCA that was perfectly normal! There have been occasions over the years of low carb/ high fat when my TC was very high: 9.7 (375) and my HDL 3.9 (150) – I tell myself I’m trying to set a world record for HDL – I’ve never got it that high again – I wonder what was it was that raised it so. Cool. Extra fat lowered LDL as per the InversionPattern. The HDL is nice! As per my conversations with Dave on Facebook, here are the results of my experiment with Zero Carb. I am a longtime low carber, focusing on protein as the most important macro. I stopped Zero Carb in Feb, 2017. 2017 Results eating around 30-50 carbs a day, AND coming off of a 10 day vacation where bad choices were made . I’m 47 years old, 5’6″ and currently weight 145lbs. Lifting and exercise 4-5 days a week. *Macros stayed the same and weight stayed the same during this time. Macros were: 90-110g protein, 70-90g fat, 30-50g carbs (once I quit zero carb). I was also given a zero CAC score in 2013 with similar cholesterol numbers like the current 2017 panel. I also carry two genes that make me predisposed to higher HDL, which has always been the case for me, even when I was eating a standardized western diet high in carbs. My HDL has been as high as 100 in previous tests. Thanks for all the great work you guys are doing! That’s for the data. 9 months is a serious commitment to an experiment! Great! Zero Carb does seem to push things more in the LMHR direction. TG down, LDL up, HDL up. So, I think I am a hyperresponder. I have been doing modified keto (low carb, high protein, moderate fat) since the beginning of June 2017. I have been intermittent fasting (at least 16:8) daily since around July 2017. I don’t have lab work immediately prior to starting keto. My HgbA1C is great, fasting glucose is below 100, and my BP is consistently around 110-120/80s. I am about 5’9 and weight around 165. I lost about 40 pounds since starting keto. I plan on doing 23 & Me to see if I have the polymorphism. Thanks for sharing the before/after. It’s actually closer to before/during since it sounds like you are actively losing weight. Since you were burning body fat, the energy available to your body is still low carb, high fat. Once you get to your ideal weight, you might feel the need to change your macros a bit. I am a 69 year old female, 133-Lb, 5′ 9″, moderate exercise, LCHF for 5 years, 2 meals/day, I fast 12-14 hours prior to all of my lab draws. So definitely better over that one week. My questions are 1) how do I hack this even more for my next doctors visit in 6 months and 2) do you guys recommend standard Keto for general health and longevity? I have a lipid panel results plus calcium score. 43 year old male, and been on keto (less than 20 net carbs per day) for one year. Calcium score after one year of keto …. 0. Yes, zero. While hypothyroid too. Congrats on the 0 CAC! The numbers look pretty typical for someone on LCHF. Out of curiosity, are you currently losing weight? Have had multiple NMRs since 2014. LDL-P always >2000. sd-LDL <90. One interesting thing to report though… I seemed to have developed xanthelasmas under my eyes that I noticed recently… so that’s about 3.5 years after the switch. Also had a CACS of 22.3 on 6/2015. I chalked this finding due to being a poorly controlled type 1 diabetic for 30 years. Have another one scheduled for 6/2018. Hoping no change in score but with the observation of the xanthelasmas it’s concerning. I want a data set for cholesterol metrics(LDL,HDL,TC,TG). Do you guys know where I can find it ? OK I am a bit of a nerd – I have kept all lab reports going back to 1989! I will show two of interest. The first one, below, was when I was eating ‘healthy whole-grains’, lots of carbs and low fat. After this result I was put onto Lipitor. As promised in the comments to your other blog post, here are my results over the years. Note, that starting in January 2015 I started to reduce carbs and by around June 2015 became consistently ketogenic. Prior to January 2015 I was also taking statins, which I stopped somewhere in Q1 2015. I have T1D, which is why you’ll see high HbA1c. Independent of the diet I’ve played soccer, tennis and stayed very active. Thanks again for all your work. I’m a software developer and run a business building and selling iOS apps. Would be happy to help in my spare time if there is anything you need. Yes — those are definitely the lipids of a Lean Mass Hyper-responder! Been on keto for a year. Here is the latest numbers and my starting numbers. Date of draw 1/19/2018, 12 hr fasted. T2 diabetic. A1c was 13.3 at this point. I’ve never been able to raise my HDL above a 40 or so. What an amazing improvement, Steve!! Congrats!!!! total Cholesterol is 314. I am going to try the protocol in March and let you know the result. this is after being on Keto 10 months i have other blood tests during that time that are very similar. That’s great, Joy — let us know how the protocol goes. Back when I was eating a SAD, my LDL was 133 (last labs were in 2015). My doc referred me to a cardiologist who is convinced I have FH and wants me on a statin immediately. I’m 29, female, 5’8″, and 127 lbs. I don’t know if I qualify as very active, I just play hockey 4 times a week. I got an NMR a week ago and LDL-P was 2066, though my LDLs are all fat and fluffy. If the rest of the measurements from my NMR would be of interest, let me know and I’m happy to post them. lp-pla was 463, typo. Also body fat at 9%. I have no real baseline cholesterol numbers except I had “borderline” high cholesterol according to conventional wisdom before keto. Also I have borderline high blood pressure at 135-85(tested daily, unchanged from pre-keto days). Lots of BPC and saturated fat intake. Naturally, I plugged in your numbers on our risk profile. Not too shabby! I have been in low carb about 10-15 years, strict ketogenic, zero carb diet about 4 months. This was my most recent blood work taken 3/5/2018. I keep carbs usually 20-30g net. For reference, I’m still in the middle of losing weight as I have lost around 40lb so far with another 30+ to go. I’m a 42yr old male 6’1. 3/3/2017 blood work on SAD. All I can say is WOW, what a difference a year makes. Hopefully you can use this data. Wow!!! What a massive drop in your Remnant Cholesterol! And that HDL is looking much, much healthier. Well done!